Nothing says Slot Game any more than fruit don't you find? Fruit Fiesta is an incredibly simple, easy to use and doesn't require much in the way of stakes. Available in both 3 reel and 5 reel format, this fruit slots is quite popular both in UK and across the pond, as a means of picking up one of those luxury progressive jackpots, we all dream of winning, but few of us seldom do. The 3 reel version of the Fruit Fiesta features three pay lines, and in order to win the big progressive jackpot you will need to have all three pay lines activated, and of course, fill that pay line with Fruit Fiesta symbols. Not to worry though, a just 0.25 a line, I find it incredible that anyone would ever choose to wager just one stake for one pay line anyway! 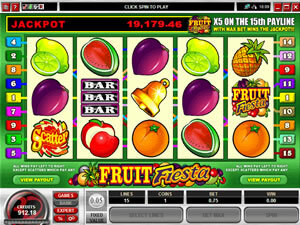 The 5 reel format of Fruit Fiesta offers a slightly less straightforward game play, with fifteen pay lines incorporated into the game. As with the three reel version, you will need to have all the required symbols, with all the pay lines activated, and your winning combination must be sitting on the fifteenth pay line in order for you to qualify for the progressive jackpot. Your winning combination must of course be, five Fruit Fiesta logos, or no deal! As you have probably imagined, Fruit Fiesta is based on traditional UK fruit machines, and the symbols represent that accordingly. Watermelons, Plums, Lemon/Limes, Oranges, Apples and Pineapples all fill the reels, as does the unusual Bell icon, which is often found on such UK fruit slots. But then there is the special symbols, the Fruit Fiesta logo and the Melon! Not only is the Fruit Fiesta symbol just the ticket you'll need to win you the progressive jackpot, it also doubles up as Fruit Fiesta's Wild card. Should you pick up one or two in your pay line, they will substitute themselves for another symbol, one that is far more useful as you try to complete the given pay line. Melons are scatter symbols and and picking up 3, 4 or 5 of them will accordingly reward you with a multiplied stake of 4, 40 or 400 times your wagered amount. There is no sure way of knowing just how much Fruit Fiesta is going to pay out when it comes to the progressive jackpot. The highest ever recorded win is in the region of £140,000 whilst the average jackpot is approximately £15,000. Just hope then should you find yourself in a winning position, that fate has decided to be even more kinder than fortune has allowed you, and dishes out the big bucks for your pay line. Stranger things have happened!